Columns and arches have long been used to decorate buildings and in modern times they add a classical, elegant finish to a house build. In ancient times they were built in materials such as stone, marble and more recently cement. These days the easiest and most effective method to build an arch or column is to use a lightweight house moulding. 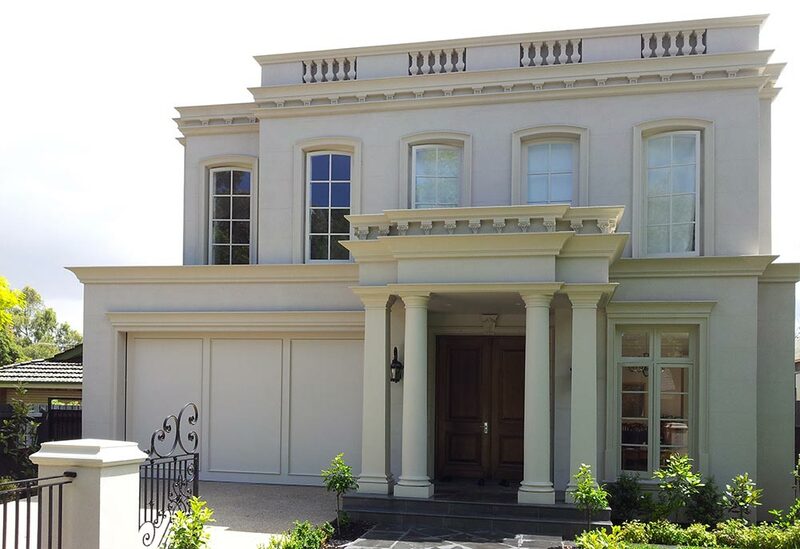 The Finishing Touch are experts in manufacturing and installing all types of columns and arches and recently manufactured and installed three columns, each 200mm in diameter and three metres high at a house in Tuck Street, Cheltenham. Five Arches were used to create a grand look to a home in Hampton, where the owner/builder is installing the arch moulds supplied by the Finishing Touch across doorways on the ground floor. Curved parapets create a modern, attractive design to a large home in Beverly Hills Drive, Templestowe. The curved parapets are positioned at the top of the first floor and second floor, with external columns supporting them on each floor. Corinthian capitals and stringers add to the overall decorative finish to this grand design. The lightweight mouldings used to create this effect were manufactured and installed by the Finishing Touch. Another large project under development is at Rose Avenue, Glen Waverley. Two units with a total of 48 squares will be enhanced by decorative Georgian style arches with dentils under the arches. House mouldings for parapets, eave parapets and corbels all along the top perimeter of the building will add further decorative finishes as well as pier caps, window architraves and stringers. The quality and finish on the Finishing Touch range of house mouldings will help create a stunning build. An ongoing project for an owner/builder of two units in Mitchell Street, Northcote, of 25 squares each, dual occupancy, now requires more house mouldings to complete the project. The Finishing Touch supplied the original lot of window architraves for the build three to four months ago. This new lot of window architraves will be in the new, prestige range of smooth mouldings. The Finishing Touch have now supplied in total twenty window architraves for the project. A project currently under development is for some units in Haig Street, Burwood. The two units, post-modern design boast one which is larger at 40 squares and with a Georgian influence, whilst the second unit is 20 squares. Exterior mouldings will be supplied by the Finishing Touch for the full façade which includes flashing/undergutter mouldings, window architraves, eave moulds, parapets and stringers. Construction on this project is not expected for another six months. The demand from Owner/ builders and Builders for the Finishing Touch lightweight moulds is growing as the efficiency at which they can be manufactured and installed becomes more widely recognised. The addition of the smooth finish mouldings to the range has also enhanced interest in using this type of house moulding for a decorative finish to a house, apartment or building. An example of the type of work the Finishing Touch can complete for home owners and builders is a house in Peppermint Grove, Taylors Hill that already had mouldings installed. The Finishing Touch were able to match the mouldings and manufacture decorative mouldings that would blend in and complement those already on the house. These have now been manufactured and will be installed this week, adding to the front parapets. The addition of window mouldings and columns will add a classic finish to the home and a certain grandeur. The third proposal is for a house in Timber Ridge, Doncaster. 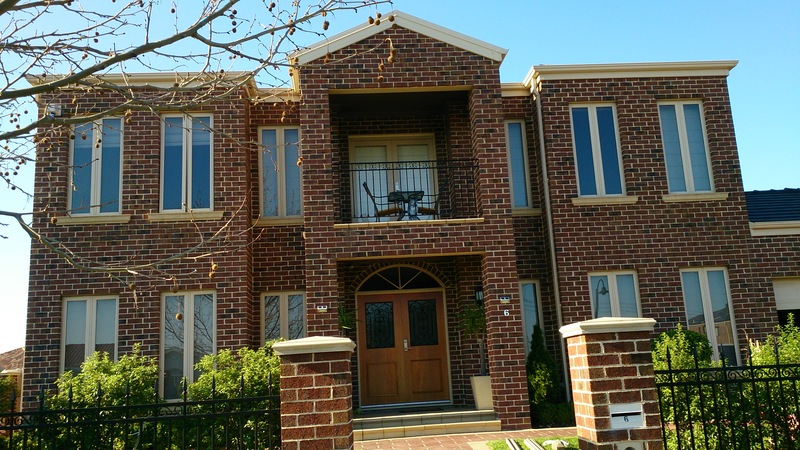 This new home has tiered garden beds built in brick to embellish the front of the home. To finish these beds off with a decorative style to complement the house, wall capping mouldings will be installed on top of the brick walls of the garden beds. The Finishing Touch are able to offer an efficient turnaround on orders. Once a quote is accepted the manufacture will commence and the mouldings will be ready for installation at the property within two to four weeks. Finishing Touch certified installers are recommended, as they use a proprietary render patch system which virtually eliminates any sign of joins and offer a seven year warranty on fixing. A client in Mont Albert Road, Surrey Hills has a house in the French provincial style and The Finishing Touch installed French Provincial parapets, French Provincial window architraves, French provincial window sills, keystones and quoinings about three months ago. The client is now adding two columns at the front and two columns at the back, as well as capping the fencing to give the house an elegant finish. The Finishing Touch are manufacturing the column mouldings as well as ten metres of wall capping and pier caps. An ongoing project supplying decorative house mouldings to a home in Francesca Street, Mont Albert North is nearing completion with the manufacture of all moulds totally completed. 85% of the mouldings have been installed and the remainder are being installed now. Another property in One Tree Hill Road, Ferny Creek has already had parapets, pier caps and wall caps supplied in the past by The Finishing Touch but as they were damaged they are now being replaced under insurance and The Finishing Touch are busy manufacturing the replacement mouldings. The owner has decided to also add window architraves to further decorate the house in preparation for sale. When it comes to renovating your home and creating a more stylish presence, house mouldings are a great choice. A house at Palmerston Crescent in Taylors Lakes (pictured) is eight years old and needs a bit of a lift. The Finishing Touch have suggested the addition of French Provincial window architrave mouldings to enhance the somewhat plain existing window sills. They will also render the reveals so the reveal and architraves can be painted the same and seamlessly blend together. A big installation is underway at Aitkens Rise, Golden Square, Bendigo. The entrance to this very stylish home will boast arch mouldings with rivet mouldings and a decorative keystone clasp on top of the arch. Two lions’ heads will further decorate the entrance, sitting above the keystone. Windows will also be fully enhanced with window architraves, window sills and keystones. There will be eleven keystones in all, over each window. Stringers will also be installed. Another installation is due to go ahead next week at Biltmore Crescent, Greenvale Lakes. This single storey, modern style home will be further stylised with a French provincial look with the addition of eave mouldings, window architraves and mouldings under the gutter. This moulding will hide the gutter and will have the appearance of a parapet mould. The property at Francesca Street in Mont Albert North will soon be looking very spruce with decorative mouldings being installed over the coming week. 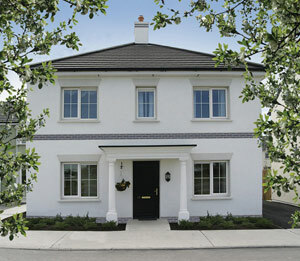 The house mouldings have all been manufactured and 85 per cent of them have already been installed. Now the installation of the remaining moulds will finish off the house.